Garden of Aaron: Garlic and Pepper Versus Rabbits? Garlic and Pepper Versus Rabbits? 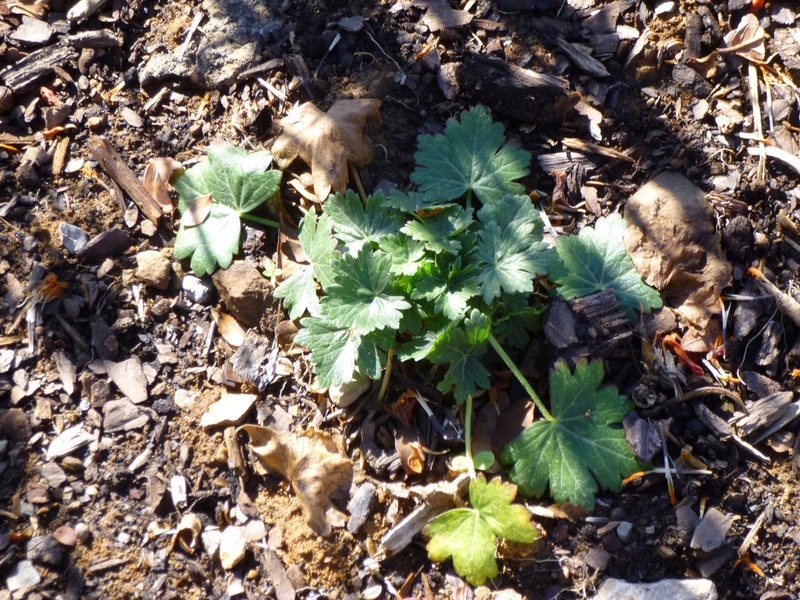 Callirhoe bushii - Bush's Poppy Mallow - before it got munched. A couple of months ago I planted a native perennial called Bush's Poppy Mallow (Callirhoe bushii) ordered from Gardens in the Wood of Grassy Creek. I planted it in full sun in a mixed perennial border where it would have some space to grow to its projected size of 3-feet wide by 2-feet high. Of course, I planted it in autumn, so I didn't expect it to do much rambling this winter, but it did provide a spot of cheerful evergreen foliage in an otherwise brown and sere landscape. I don't know if the plant can recover from such a severe chomping. 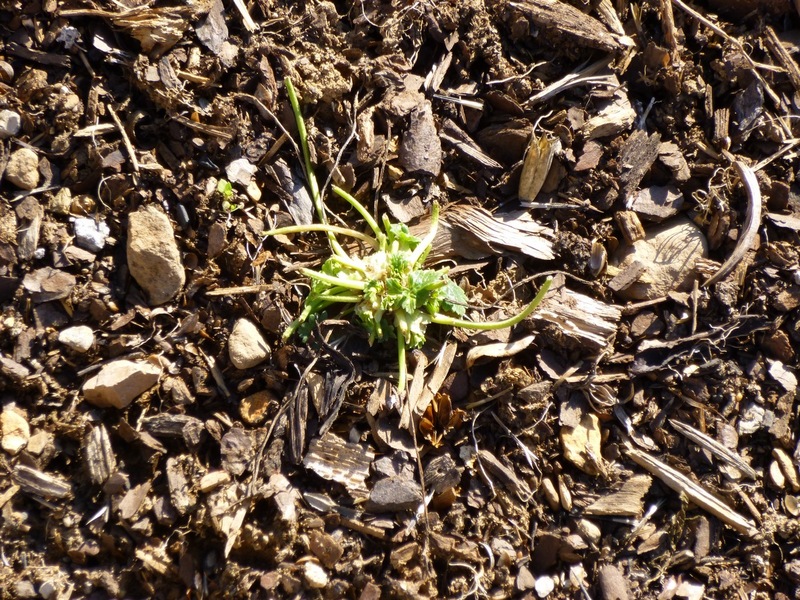 I also don't know for sure which critter is the culprit, but a quick search on the Web turned up the fact that rabbits - and deer - apparently prey on Callirhoe bushii. And I don't fancy going out and spending a lot on some special critter repellant. I tried that last year to protect some crape myrtle and maple trees from deer that kept rubbing the bark off with their antlers and my deer apparently weren't at all bothered by the sprays. Who knows, maybe the deer here are olfactory-challenged. A number of Internet sources suggest that sprinkling pepper on tender greens can deter marauding rabbits. Can I just dust some pepper on the leaves or should I make a pepper-and-garlic spray? The final option of course is simply to let things take their course. I try to practice a very low-intervention garden. I could hope that the plant recovers and grows back. Perhaps when there is more greenery to be found in the springtime, the rabbits or deer will leave my Callirhoe off their menu? There are plenty of plants that rabbit and deer don't eat (or at least have not eaten so far) and perhaps I would be better off in the long-run chalking this up to experience and learning that I should take better care in the future to make sure that new perennials I buy are not on a rabbit or deer's favorite-food list! Y'all come back and visit or just subscribe by email to find out whether I try any of these rabbit repellent techniques and/or end up accidentally dousing myself in pepper-and-garlic spray. Stranger (but not smellier) things have happened. Hi Aaron...don't give up on your Poppy Mallow....it will come back. I know you said you didn't want to spend a lot on repellant, but may I make a suggestion. I started having problems with rabbits and deer so I went to my local Lowes and bought some Liquid Fence for deer and rabbits. It's not that expensive and a gallon lasts a very long time because you don't use a lot on each plant that's "on the menu". It worked better than I could have expected and I no longer have any problems. Thanks for the moral support, Christy. Aaron, I'm sorry to see that your Callirhoe is being enjoyed too much by the wildlife. I'll bet deer are doing this - they love the mallows. There are quite a few of my flowers that they like to eat (such as Echinacia), but they don't die, pull through, and even bloom. I hope yours will, too. I guess there's just so little for them to eat right now; when spring comes, hopefully, they'll move on to "greener pastures." I've had the rabbits do the same thing to my woodland phlox and young aronia bushes. Ultimately I did make chicken wire cages. I had rabbits prune my dwarf heliopsis down to the base and it rebounded so fabulously that I'm now going to prune it hard every spring so I can have the same fullness it had last summer! Do you have a cage or smashed up tomato trellis you can put over it? That's probably the best bet. Oh gosh, unfortunately I've seen that scene wayyy too many times! Pesky rabbits! When I was a child, I thought they were cute, cuddly, sweet animals. Now I think they are the enemy! I think Tammy is right--only a cage or a wire surround will ultimately keep rabbits out. Other things I've tried that worked temporarily--Scallions planted around the perimeter of the garden, rough cuttings from poky evergreens piled around the plant, used cat litter (gross, I know), deodorant soap shavings. But ultimately, the only thing that keeps the enemy out is some type of physical barrier like wire mesh, a fence, or screening. Good luck! I just came in from doing a little light pruning outback. Seems I didn't need to do much .....the deer have been munching away in my garden. All my azaleas and cleyera were nibbled down quite a bit. I don't normally spray much...though the bunnies make me crazy in the front garden. I will have to get out the garlic/putrefied egg mixture and spray. For my roses closer to the water I layer the cuttings from my Catmint around the roses and the deer seem to leave them alone. The rabbits have eaten my heuchera in one area and left others 20 feet away, alone . Thanks for the comment, Janet! I had no idea that catmint repelled deer! I have a number of old wire hanging baskets that are useful for protecting such sad scenes as this one - or you could dig it up and stick it in a pot till it is older and tougher. I do that too sometimes. Do you have a picture you can share of your wire hanging baskets? If I knew what it looked like (I think I have an idea) maybe I could find one locally. Subscribe via email and get new posts delivered straight to your inbox! New Growth in the Sedum Patch! Have You Seen These Bushes? Help Wanted: Best Quick Privacy Screening Shrubs for Zone 7? © Aaron Dalton 2012. Simple theme. Powered by Blogger.